Q: Today, President Xi Jinping delivered a keynote speech at the opening ceremony of the Boao Forum for Asia annual conference in which he talked about major measures China will take to expand opening-up. How will these new measures impact the development of the region and the whole world? A: As China's reform and opening-up enters its 40th year in 2018, President Xi Jinping made a keynote speech at the opening ceremony of the Boao Forum for Asia annual conference. He reviewed the remarkable achievements China has made in the past 40 years of the glorious journey on the path of reform and opening-up. He summarized the ingredients for the success of such a journey and highlighted the important contributions China's reform and opening-up efforts have made to the world over the past 40 years. Chinese leaders made the historic decision 40 years ago to carry out reform and opening-up which changed the course of China's future. Our efforts to implement that decision have contributed enormously to world rejuvenation and prosperity. China has grown stronger and forged win-win cooperation with other countries amid reform and opening-up. As President Xi Jinping pointed out in his speech, reform and opening-up, China's second revolution so to speak, has not only deeply changed the country but also profoundly influenced the whole world. Opening-up, as China's basic state policy, has driven forward reform and development. We have said many times that China's door to the outside world will only open wider. 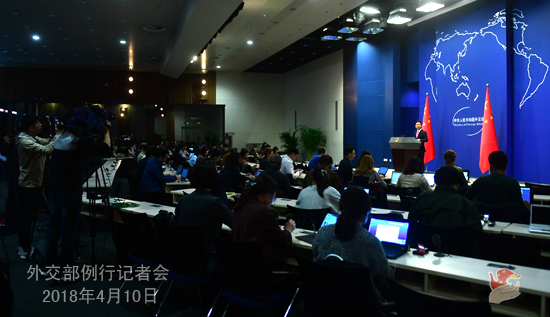 President Xi Jinping in his speech this morning announced a series of important new measures to expand opening-up, promising to ease market access, improve investment environment, enhance IPR protection, and take the initiative to expand imports. Such announcements, closely followed by the international community, received warm responses from the audience and wide approval from the international community. Today's world is seeing a resurgence of unilateralism and protectionism. The multilateral trading regime is faced with challenges, and the economic globalization is mired in difficulties. Under such circumstances, China is holding high the banner of trade and investment liberalization, striving to build an open world economy, and calling on all countries to commit to win-win cooperation. With the announcement of these major measures for greater opening-up, China is taking concrete actions to support and propel the development of international trade and world economy. President Xi Jinping's words has sent a clear message to the world that China's development offers opportunities to the world. We would like to share these opportunities with others and sincerely wish that other countries could catch a ride on China's fast train of development. Q: What is your response to reports by Australian media saying that China is building a military base in Vanuatu? Do you think that Australia should worry about the large strategic infrastructure projects that China assists in the Southern Pacific region? A: In one word, fake news. You may have noted that the Vanuatuan Foreign Minister already made clarification in an interview with the media today. Q: According to reports, on Monday, a Taiwanese navy flotilla docked in Nicaragua. What is China's comment? A: There is only one China in the world, and this is the universal consensus among the international community. Adhering to the one-China principle is the trend of the world today. We believe all countries around the globe will accept this consensus and embrace the trend. Q: According to reports, another chemical weapon attack in Eastern Ghouta, Syria has caused casualties of civilians. Facing possible escalation of tension, the United Nations Security Council held an emergency session in response. The United States said it would make major decisions on Syria within the next 24 to 48 hours, and a military operation cannot be ruled out. What's your comment? A: We have stated China's position on the issue of chemical weapons many times. We firmly oppose the use of chemical weapons under whatever circumstances and for whatever purposes by any country, organization or individual. 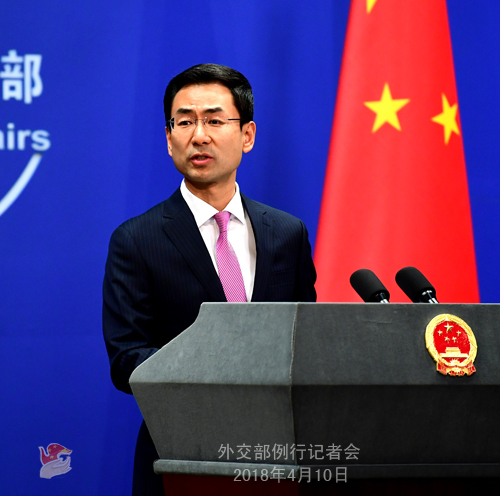 As to suspected use of chemical weapons, China maintains that a comprehensive, objective and impartial investigation based on scientific investigative method and solid evidence shall be carried out to reach a conclusion that can stand the test of time and fact. Yet before that, parties should not make a prejudgment and jump to an arbitrary conclusion. The Syrian issue now stands at a crucial crossroad. Political settlement is the only viable way out and military means will lead to nowhere. China always stays committed to peacefully resolving disputes, opposes the wanton use of or threat of use of force in international relations and advocates acting in accordance with the UN Charter. China is willing to work with parties in support of the mediation by the UN to ease the tension in Syria and promote the political settlement of the Syrian issue at an early date. The Foreign Ministry and the People's Government of Henan Province will hold a promotion event here at 3:30 pm on April 13 (Friday) under the theme of "China in the New Era: Global Partnership, Wonderful Henan". State Councilor and Foreign Minister Wang Yi will deliver a speech. Party Secretary Wang Guosheng and Governor Chen Runer of Henan Province will also address the event. Representatives of foreign diplomats in China are invited to make remarks and interact with the audience. Henan is one of the most populous provinces in China with agriculture a pillar of its economy. It occupies an important place both in China's transportation network and in China's long history of civilization. At present, Henan is actively implementing the important strategic plans of the 19th CPC National Congress and leveraging its unique advantages to build a modern economic structure, step up opening-up, and participate fully in the Belt and Road Initiative. All these efforts will help build Henan into a new platform in the new era for inland provinces to open to the outside world. We believe that through this promotion event, you will see a colorful Henan with history meeting modernity. We look forward to your attendance at and coverage of this event. The regular press conference of the Foreign Ministry will be adjourned on that day. You may still reach the Office of the Foreign Ministry Spokesperson by phone or fax.